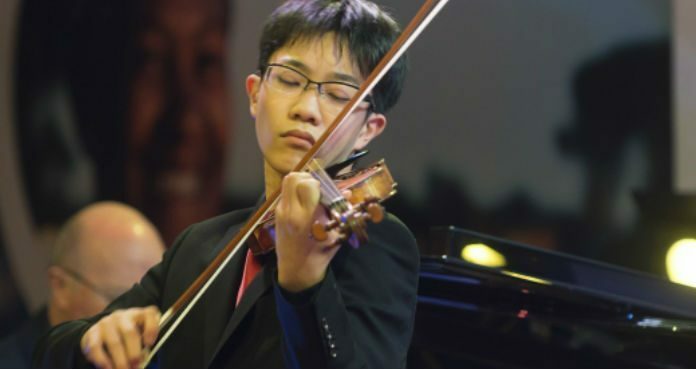 19-year-old Japanese violinist Rennosuke Fukuda is quickly building an international reputation as a young virtuoso of outstanding talent – praised for his virtuosity, musicality and showmanship. A student of Pavel Vernikov and Svetlana Makarova at the Haute Ecole de Musique de Lausanne, in Switzerland, Rennosuke is a former 1st prize winner at the Menuhin, Kloster Schöntal and Valsesia Musica International Violin Competitions – and was recently awarded 4th prize at the 2018 Joseph Joachim International Violin Competition, in Hannover. His recent debuts include solo engagements with the Cleveland Orchestra, London Philharmonic, Moscow Philharmonic, Romanian Radio National Orchestra, North Czech Philharmonic, Osaka Philharmonic, Hiroshima Symphony, Kansai Philharmonic – and the Okayama Philharmonic Orchestra.